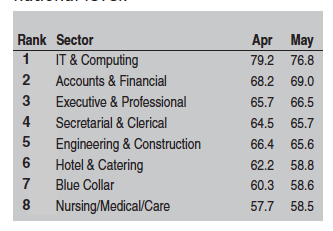 It seems that almost every month we report yet another sharp rise in the recruitment market. 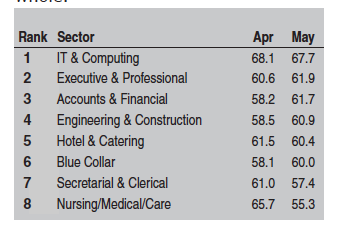 The REC/IHS Markit report for May shows that for Scotland the rate of expansion for all jobs (not just IT) accelerated to a 43-month high and was the fastest of all five monitored UK regions. In the UK as a whole, there were "steep rises in both permanent placements and temp billings.. (and we saw) ... staff vacancies expand at the quickest rate since last November." Moreover, in good news for candidates in both the UK and Scotland, salaries are continuing to push upwards, largely as a result of a deterioration in candidate availability. What does this all mean for clients and candidates? Well, rising salaries are good for candidates but obviously increase employers' costs. Moreover, the shortage of skilled candidates who will take the employers' firms to the next level means that this premium is unlikely to change in the short-term. In the short-medium term, I can't see any major changes in the IT recruitment market, which means (dare I say it) that if you are looking for staff, whether contractors or permanent, you'll need to talk to a recruiter who knows their stuff. If you are stuck I can recommend someone!